Eddie Howe continues to make Bournemouth very hard to beat. "An alternative to laying Manchester United is to go with both teams scoring. It’s a bet that would have paid out in 50% of United’s away games this season but that figure shoots all the way up to 70% when looking at Bournemouth’s home games in 201718. Hardly surprising when we consider the Opta stat that they’ve conceded in all of their last 11 at home, a record for the Premier League." Bournemouth just weren't at the races on Saturday evening at Anfield. 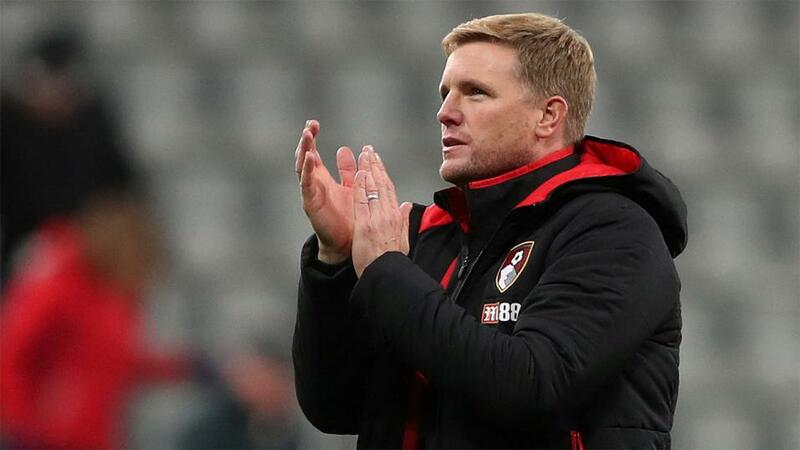 It was almost like it was a damage limitation exercise from the word go, where Eddie Howe decided that saving face and energy levels for upcoming matches was the strategy for the day because they were never going to get anything out of the game. The proof will be in the pudding. If they put in a much-improved performance here and get a result, the approach will be justified. Midfielder Junior Stanislas continues to miss out through injury and he's a big loss. So is defender Adam Smith. Both have knee injuries. What a difference a week makes. From their heroics at the Etihad to win from 2-0 down and deny City the chance to lift the title on home soil to...a 1-0 defeat at Old Trafford to the side who are bottom of the league. The worrying thing for Jose Mourinho is that it wasn't even a 'smash and grab' job. Yes, United dominated possession (67%) as you'd expect but West Brom gave as good as they got in terms of shots and corners. No player represented the drastic change in fortunes from one week to the next better than Paul Pogba. Two-goals here a week ago, on Sunday his shooting was off target, he rarely saw the ball and made a number of clumsy challenges that saw him get booked and then subbed before he inflicted further damage on himself. But he'll almost certainly start here. Jesse Lingard will probably get a game here with Juan Mata the most likely to give way. But after what happened on Sunday, that might not be the only change. United are [1.76] and you could say that's understandable given that they are after all second in the league table and have playing resources that are a world apart from what Bournemouth have. But I'm not so sure. As mentioned already, Howe seemed to be targeting this match as a chance to pick up at least a point and the Cherries boast a decent record against United since achieving top-flight status. Since achieving promotion in 2015/16 they've beaten them once and drawn another from five games and were only narrowly beaten 1-0 earlier this campaign. They've also been extremely hard to beat over the past few months, losing just two matches out of their last 15 in the league. Laying the visitors is certainly the value play here. An alternative to laying Manchester United is to go with both teams scoring. It's a bet that would have paid out in 50% of United's away games this season but that figure shoots all the way up to 70% when looking at Bournemouth's home games in 201718. Hardly surprising when we consider the Opta stat that they've conceded in all of their last 11 at home, a record for the Premier League. That 3-0 loss at Anfield to Liverpool was also the first time in nine Cherries games where both teams didn't score so the recent trend is certainly for that outcome. There's further ammunition for that bet when looking at the head-to-head between these two. Both teams have registered on the scoresheet in four of the five games since Bournemouth were promoted to the Premier league with that 1-0 United win the odd one out. A quote of [1.8] is a very fair one, all things considered. There are some slightly short prices about the usual suspects amongst Man Utd players. Romelu Lukaku is 6/5, Anthony Martial and Marcus Rashford are 7/4 and Jesse Lingard can be backed at 9/5. Given none of those last three is a certain starter, those are all prices to avoid. If you're desperate to back one of Mourinho's men you could say it's a bit of an insult to a player of Alexis Sanchez's ability to be a bigger price at 15/8 than any of the three just mentioned. His struggles since arriving at Old Trafford have been well-documented but he's too good a player to be kept quiet for long. As for Bournemouth, they're one of those sides who really share their goals around so it's a little hard to make a confident call. But Joshua King has been in good form of late and Bournemouth seem to win quite a few penalties so you've always got that going for you if you take the 3/1 about him. Graham Scott does most of his work outside the Premier League so it's not so easy to assess how strict he is when refereeing games in this division. But he was in charge of Bournemouth's win over West Brom just over a month ago and showed three yellows in that one. He was busier when in charge of Tottenham's 2-1 win over Stoke a couple of weeks ago, showing seven yellows. Laying 25 pts and under in the bookings odds market should be a pretty safe bet.